Four of the best women’s swimsuits and three essential swimming accessories for watersports activity breaks, tried and tested by our gear expert. If only we could throw on a pair of board shorts or spandex trousers, without having to worry about support and a “stay-on” guarantee. But outfitters are getting savvier about the growing market of women triathletes, swimmers and surfers who seek streamlined one and two-piece swimwear. When it is time to hit the pool or the high seas, the models featured below get it right with their modern fabrics, supportive designs and athletic cuts. To keep swimwear in good shape, rinse in fresh water immediately after a swim; chlorine and salt are both corrosive. Best to wash by hand, or in a low-temperature 30C machine wash. Drip-dry out of direct sunlight; intense heat or the sun will break down the elasticity of swimwear. No matter how well you look after your swimsuit, if you train regularly it will inevitably start to lose its colour and shape. If you cannot live without your favourite model, buy a second before the range is discontinued. 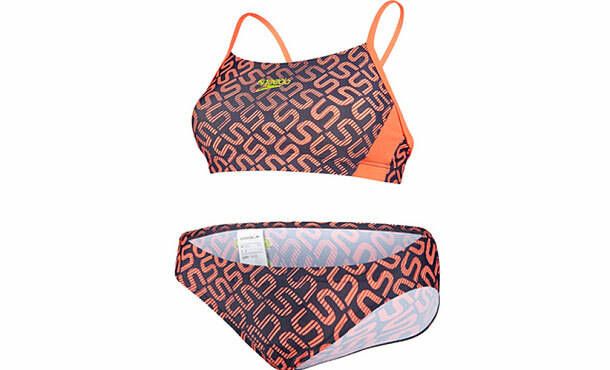 Not everyone feels comfortable in a two-piece when it comes to active sports, but this slick bikini is supportive yet stretchy for a hard-wearing sporty fit. The high-stretch fabric is soft, lightweight and unlined yet retains its shape even with regular use. It is quick-drying and chlorine-resistant and the tessellated pattern will not fade easily. A good choice for the pool or sea, or for windsurfers and kitesurfers. Designed for swimming and surfing, this pairing provides top-notch support, comfort and style. Zira’s cross-back multi-strap and fixed empire band provide good upper support. The full bust coverage and generous lining with removable cups mean no transparency or silhouette, but note that the thick fabric is slow to dry. The retro Zuri bottoms with full seat coverage are mid-rise with a wide waistband and a hipster leg cut offering a flattering fit. It also comes with inbuilt UV protection. It’s a head-turner as well as an effective activity swimwear piece, but with a high price tag. This Californian brand’s coveted range also includes sporty swim tights and neoprene shortie wetsuits, which are great for surfing and stand-up paddle boarding. Part of the new Aqua Light range with water-repellent properties, the Maputo’s fast-drying breathable fabric is comfortable next to the skin without that clingy feeling out of the water. The inbuilt shelf bra offers shaping and support and the crossover back straps make for a reassuring fit. Strong contrasting colours, asymmetrical panels under the bust and a flattering medium leg cut make for an athletic look. The durable chlorine-resistant fabric means a long shelf life and there is good UV protection, too. The easiest option. Its lightweight and quick-dry qualities make it ideal for regular swim training in the pool and for travel. Designed for cooler waters, this 2mm double-lined neoprene shortie is shaped like a classic one-piece swimsuit, meaning there is not the excess bulk or flotation that comes with fuller-coverage wetsuits. The supple material allows for freedom of movement, and the clever cut includes wide shoulder straps and multiple stretch panels with strong stitching. The front zipper has smooth seals to reduce water flow inside. The best option for cooler temperatures, especially for open-water swimming, snorkelling and kayaking. This swimsuit can also be used as a base layer of insulation under a wetsuit. Designed for women, these multi-use mask goggles are slightly narrower on the face yet still maintain 180‑degree visibility. Easy-to-use side buckles make it quick to fit while on the face, and multiple adjustments make it comfortable and leak-free; the soft silicone skirt seals well even at higher swimming speeds. Bulkier than closer‑fitting race goggles, these may not be the best option for competitions when every second counts, but for wild swimming events the excellent outlook more than makes up for the drag. The clear lenses offer 100 per cent UV protection; tinted lenses are available on the standard Vista mask. Dispensed as a stick, this is easier to apply on goggle lenses than most anti-fog sprays. This highly viscous solution also lasts well, lessening the need for regular reapplications. A good-value combination for regular swimmers, especially those who train in a pool. The ear plugs prevent water from entering the auditory canal, protecting the drum membrane; its effectiveness can be enhanced with Earol Swim (simplyswim.com), an all natural tea tree oil spray which coats the canal with a water-resistant barrier. The nose clip is a good fit for smaller noses but may be a bit of a squeeze for bigger ones – although that is the point. As the lucky child of an airline pilot, Michelle embarked on overseas adventures from a young age, including camping in the Australian outback, volcano‑trekking in Hawaii and driving across Tsavo National Park in Kenya. Her wanderlust and spirit of adventure has never waned. She loves nothing more than feeling the grit and fear when pushing herself to the limit, whether that’s in climbing Mont Blanc, swimming with whale sharks in Mexico, flying, diving, sailing or rally driving. Michelle is motivated by sport and extreme adventure to keep fit and feed her competitive spirit, not least because she believes there are too few women in the public eye who are willing to show themselves at rock bottom. “I’ve always preferred mud and sweat to make-up,” she says. She swears by reliable equipment, which has made her toughest challenges more comfortable at the very least and at other times has saved her life. She is a self-confessed gear addict and would love to hear from readers about any equipment that they love or loathe. Follow her on Twitter: @michellejchan.